Author's Note: This review is in conjunction with the 2015 TCM Summer Under the Stars Blogathon taking place at the Journeys in Classic Film site. Today we celebrate Debbie Reynolds, one of the few SUTS actors still alive as of this writing (and I might add, a native-born El Pasoan). While best known for her perky and cheerful persona and musical skills in such films as Singin' in the Rain and The Unsinkable Molly Brown, I've selected The Catered Affair, a little-known film where Reynolds didn't rely on her upbeat screen image. 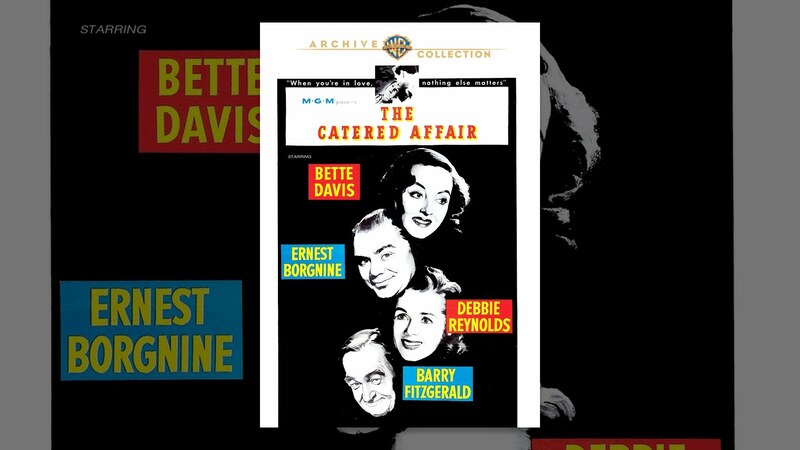 In fact, The Catered Affair is a rare dramatic turn where she was asked not to sing or dance, and where I think she was called on to not just act, but act with three Oscar winners. A daunting task for someone who up to this time was known as a hoffer with a big smile. Thanks to Kristen at Journeys in Classic Film for allowing me to participate. Taking a page from Marty, another Paddy Chayefsky television play was given the big-screen treatment. 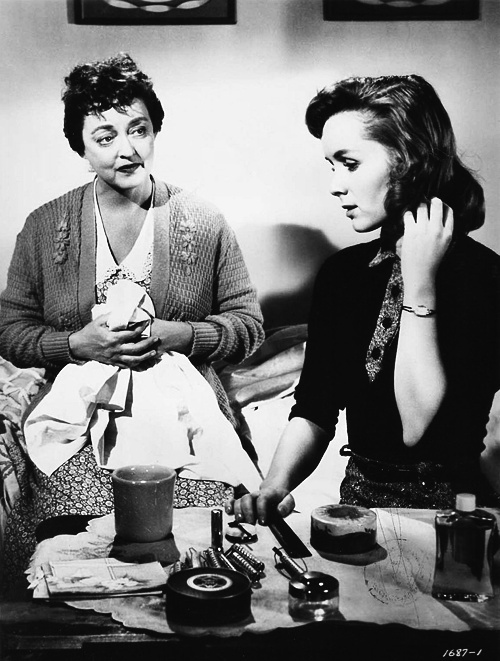 The Catered Affair has a lot of curious elements in it: Bette Davis as a frumpy Bronx housewife, and elitist pseudo-intellectual Gore Vidal (or as I call him, BORE BANAL) writing the screenplay of a lower-class family. Despite all this, the universality of the uniquely American tradition of big weddings comes through in a strong drama that draws you in. Tom Hurley (Ernest Borgnine), a taxi driver, has chanced upon the best luck in the world. Someone he knows is about to retire and thus can sell him and a friend his medallion for $8000. This means that he and his friend can go into business for themselves, as New York limits the number of medallions it offers cabs, but they can be sold by the owners to others. Unbeknown to him, his daughter Jane (Debbie Reynolds) has gotten engaged to Ralph Halloran (Rod Taylor) and they have a time crunch in getting married as they plan to go to California to help a fellow couple move who need a car and the other couple's wife is pregnant. The news hits the Hurley family with surprise, especially the fact that Jane wants a very small wedding: just immediate family on both sides and no reception. Tom's willing to go along with this, but his wife Agnes (Bette Davis) is not thrilled that she can't give her only daughter the big wedding she herself was denied. Still, reluctantly she goes along with her daughter's wish, at first. Not thrilled with the news either is Uncle Jack (Barry Fitzgerald), who despite paying half the rent and being Agnes' brother is excluded from the wedding because he isn't immediate family. Thus begins the problems: if they invite Uncle Jack, they feel honor-bound to invite all their extended family and friends. When the Hurleys have the more upmarket Hallorans for dinner, their social status hits the Hurleys more and soon Agnes becomes determined to show they aren't poor. She gets Jane to reluctantly agree to a reception, and then things start growing, with hors d'oeuvres and limos and a wedding gown. This is bleeding Tom dry and worse, taking from the money he saved up to get the medallion, but Tom cannot bring himself to say he'd rather use the money on the medallion than on one day. Even Ralph finds the proceedings rather unhealthy, and Jane's poor friend (literally) Alice (Joan Camden) asks to withdraw from being matron of honor, finding the $35 for a dress too much for her and her unemployed husband, who similarly can't afford a blue suit to accompany her. It gets to a point where when Alice says that a sudden turn now lets them be able to afford it, both Jane and Ralph realize they are lying and getting into unnecessary debt. Eventually, Jane pushes to go back to her original plan, highly upsetting Agnes. The rift between Agnes and Tom grows, but in the end, as they go off to their daughter's wedding, Agnes and Tom find they do love each other, with Agnes presenting something a gift to Tom: his money that will allow him to buy the medallion after all. I think the success of The Catered Affair comes from its universality. Every one of us has either participated or been at a wedding, and we see the pressure to impress, to figure out whom to invite, to be dazzled by the bride's gown, to sample the food. If I may, I remember one wedding I attended. It was at a small hall, there was a set meal, and the music consisted of playing about four songs before the bride and groom left. They did leave behind a karaoke machine for us to enjoy, but the whole thing ended by nine. When I got home, my mother expressed surprise that I was back. "You didn't go to the wedding? ", she asked. "Mom," I replied, "it's already over". I had gotten home at 9:30. We had judged the wedding a failure, despite that this was what the bride and groom wanted (at least we figured). As such, the idea that the Hurleys, particularly Agnes, wanted a big wedding to show they weren't poor and give the best impression. However, we also see that even with the best of intentions things can quickly spin out of control. The Catered Affair doesn't have an evil force. I don't believe that Agnes is a villain. She doesn't want to cause harm and means the best for her daughter, but she becomes blinded by her own lost wedding and with a chance to essentially live out her own hopes through her daughter starts pushing people into doing things they'd rather not do. It's interesting to see Davis in a working-class role, and part of me thinks she didn't quite get it. Davis is a bit too posh to be completely believable as a Bronx housewife, her clipped speaking manner at odds with her efforts at a Nuw Yawk accent. She did if not a brilliant job at least a great effort. Much better is Borgnine, who is at home in the Chayevsky world. I did wonder why Tom never flat-out told Agnes that he wanted to use the money to get his medallion, indicating a bit of a weakness in him. That never sat right with me. I think Debbie Reynolds (our star of the day) comes off best, despite not being fond of the film itself. It is so rare when Reynolds was allowed a rare dramatic turn which went against her screen image as the upbeat ingénue with a bright smile and a song in her heart. Here, she is able to hold her own against titans like Davis and Borgnine. Her Jane is a good Catholic daughter caught between pleasing her mother and her fiancée, trying to navigate everyone's expectations and constantly finding herself at odds with her own wishes. It's a sign that Reynolds, when given different material, could handle straight drama. It is curious also that despite how good she could be with material like The Catered Affair, Reynolds was rarely given the chance to do straight drama. It's a shame really, since she was so good at it that she could have been a strong dramatic actress in her own right. This was also Taylor's first major role, and as the lower-middle-class man who wants to marry quickly he did well, though the part wasn't the most fascinating. The Catered Affair has some curiosities. It looks like Vidal and director Richard Brooks attempted to lengthen the film with a subplot involving the bachelor Uncle Jack's flirtations with the Widow Mrs. Rafferty (Dorothy Stickney). The subplot wasn't bad, and Fitzgerald and Stickney worked well together, but I do wonder what relevance it had to the overall plot. Still, the fact that I think people can relate to the story and the generally strong performances makes The Catered Affair a film people will enjoy as much as a good wedding. I'm not really a fan of Reynold's 'super cheerful' movies so I really enjoyed her in this film. And it really puts "big show wedding" vs. what it's really supposed to be in perspective. Every engaged girl should watch it before starting to plan their wedding, especially in this age of Pinterest where there are literally millions of ideas that turn the focus on the guests rather than the couple. I like some of Reynolds' lighter work but think that she was a bit typecast, so The Catered Affair is a rare moment when she was allowed to show she could handle straight drama well. The film has aged well, primarily because the pressure to go bigger when it comes to weddings has grown, so if things start getting out of control, maybe they should pop this in to give them some perspective. As for Fitzgerald, he was good but still wonder if his subplot was there to lengthen the film.